[Florian] has been hard at work creating this automated setup to queue jobs for his 3D printer in order for it to run while he’s not around. It’s not quite finished but the concept is there and he’s started doing some tests! He’s using the uArm, which was a highly successful kickstarter earlier this year — it’s an Arduino-compatible microcontroller driven 4-axis parallel-mechanism robot arm, based off of the industrial ABB PalletPack robot. As soon as he got all the parts he setup a quick test to replace the build platforms using the uArm. 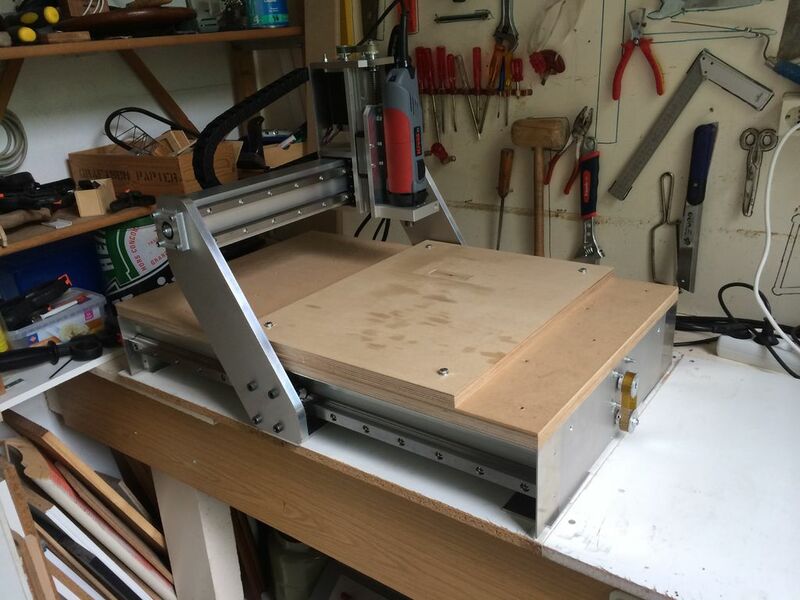 [Mynasru] tipped us about a homemade CNC milling machine that his friend [trochilidesign] recently made. We have to admit it may be one of the best ones we’ve featured so far on Hackaday, mainly due to its elegant design (see picture above) and its all metal structure with linear guide rails. In the very well detailed write-up, we can gather that the CNC machine was designed using SolidWorks. The main frame is built around 2 Maytec 40x80mm profiles and 2 endplates made from 10mm thick aluminum. 3 Nema 23 stepper motors and their drivers power the build, all of them bought on ebay. Finally, the Mach3 CNC software was chosen to interpret the G code and send the appropriate control signals. Due to licensing restrictions the original author can only provide us with PDF files detailing each part of the machine, but we’re sure this should already be enough for interested persons out there. When it comes to building retrocomputers, there are two schools of thought. The first is emulation, that allows for greater compatibility and ease of use, and much easier to find parts. The second requires real, vintage hardware with all the bugs and idiosyncrasies found in vintage chips. Reconciling these two ideas is hard, but the software defined Propeddle manages to do it, all while using a real 6502 CPU. The trick here is using a Parallax Propeller for the heavy lifting of loading the ROM into RAM with an extremely clever technique using the Reset and NMI pins, generating the clock and other signals required by the 6502, and hosting the keyboard, serial, and video I/O. Already [Jac] has the Propeddle running as an Apple 1 emulator (video below), making it possible to write programs for the Propeddle in BASIC or assembly. It’s a great design that allows for emulation of a lot of the classic 6502 computers with a real CPU, all while doing away with the cruft of expensive ACIAs and video generation hardware. Awesome work, and we can’t wait for the next version that will be dedicated to [Bill Mensch]. We’ve covered these CNC 3020’s in the past. They are physically solid machines but the electronics offer some room for improvement. [Peter] is certainly no novice at working on these machines. He’s already fixed a failed power supply and he’s back at the upgrades, again focused on the power supply. This time he’s replacing the transformer-based one with a couple switching power supplies. The stepper controllers and spindle speed circuit need both 48 and 24 VDC. [Peter] purchased two separate power supplies, one for each voltage required. Before installing the new supplies, the stock one had to be removed, along with the transformer. Even with the old parts removed, there was still not enough room for both new supplies to be installed inside the stock case. [Peter] decided that mounting them to the top of the case would be appropriate.